Cape Town - Some of the country's most accomplished sprinters, hurdlers, jumpers and throwers have been included in the entry lists for the ASA Grand Prix series at Mangaung Athletics Stadium on Saturday. In what promises to be a thrilling men's 100m race, the line-up features sub-10 speedsters Simon Magakwe and Thando Roto, as well as in-form powerhouse Emile Erasmus and national 200m record holder Clarence Munyai. The field for the women's 100m event, will be spearheaded by SA record holder Carina Horn, who is preparing to face the potential challenge from Tebogo Mamatu and resurging Tamzin Thomas. Elsewhere on the track, a handful of athletes who have broken the 50-second barrier will square off in the men's 400m hurdles event, including former Commonwealth Games champion Cornel Fredericks, as well as PC Beneke, Le Roux Hamman, Lindsey Hanekom and Constant Pretorius. In the women's one-lap race over the barriers, world junior champion Zeney van der Walt will also look to light up the track as she takes on former Youth Olympics gold medallist Gezelle Magerman in another promising thriller. And though he can expect to have things his own way in the men's 110m hurdles contest, national record holder Antonio Alkana could be chased by experienced rival Ruan de Vries. Infield, long jumper Zarck Visser will look to build on his superb form after equalling his personal best with a big leap of 8.41m at the Central Gauteng Athletics Championships in Germiston last month. Visser's strongest opposition is expected to come from Cheswill Johnson and Dylon Cotter, who have both previously cleared the eight-metre barrier. And in a battle of the giants, the men's shot put could also produce fireworks, with Orazio Cremona set to face the likes of Jason van Rooyen and Kayle Blignaut - who won the world junior title in Tampere last year. 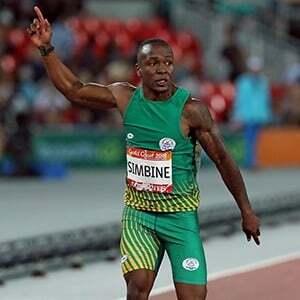 In a key element to the programme, Athletics South Africa will provide opportunities for the country's fastest athletes to prepare for the World Relays in Yokohama next month, and the national men's 4x100m team is expected to target a fast time, spearheaded by SA record holder Akani Simbine. Ahead of the Mangaung leg of the Grand Prix, Tuks Stadium in Tshwane was on Wednesday the scene of intense training by the national relay teams, two of whom - 4x400m men and women - are searching for their respective qualifiers for the World Relays. Adding some international flavour to the Athletics Grand Prix Series opener, teams from Botswana, Kenya, Lesotho, Mauritius and Swaziland will take part. The action starts at 5.30pm and the programme will come to a close at 7.15pm. Sports fans in the city will be treated to a sports extravaganza on Saturday when the Free State Stadium in Mangaung hosts the Athletics Grand Prix and a PRO14 rugby match between the Cheetahs and Welsh team, the Dragons, in a special partnership between the two sports entities.